We made a huge improvement on product UI since version 7.0. Now nearly all operations are able to be finished from the new home page, we hope this can help users maintain the routine backup jobs more easily and smoothly. This article tries to describe the 3 main areas on the new home page one by one, we believe both loyal and new users can get started quickly after going through the whole page. The entries of all available backup options can be found in this area, with them, you can directly start a new backup job here. The items in the drop-down menu of Other Backup varies based on the license you have, the higher license you have, the more options you will find in it. For example, Exchange backup and SQL backup show themselves there in Advanced sever and Technician edition. What is the difference between System backup and Disk/Partition backup? How to create a schedule backup? 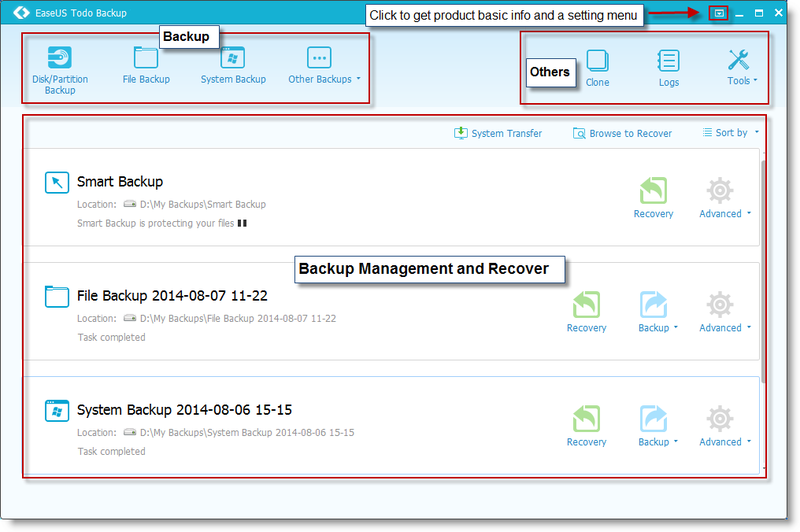 The old Backup Management page has been integrated in the new home page. All basic info of a backup task can be directly found in the list. Including Plan name, Image location and you are also allowed to Pause or Resume an auto schedule. Besides, directly starting a recovery from this area since version 7.0 is also possible. There is a Recover icon for each backup record. Click it can bring you the recovery configuration page. Or if the item of the backup in Management box has been removed, Browse to Recover button allows you to manually locate the image file from Windows directory tree and proceed a recovery process in a different way. Another main option Clone now is located in top right corner, and it can help user move data or system from an old drive (partition) to a new one (partition). Most operating records in our product will be saved in Logs, not only all execution results of backups can be found here, but also some clues for a failed backup exist in the list which may offer you an idea how to correct the backup. 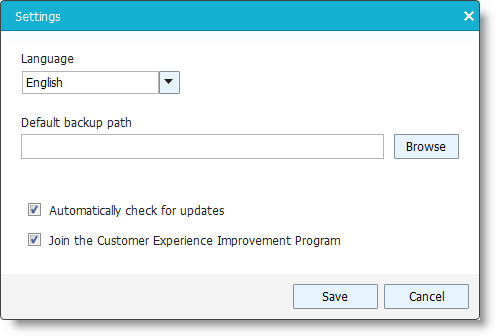 In the drop-down menu after clicking Tools, there are some useful options for backup users. One of them is very important and essential for system recovery process, it is Create Emergency Disk. Without it, system is unable to be recovered after a terrible system corrupt or failure. For the others, they are required for a specific purpose or only advanced user needs them. What is the difference between Clone and Backup? There is a drop-down menu on the top right corner, click it, there will be an option Settings in the menu. Click Settings will bring you the following configuration panel, the first 2 options here are very important. You can switch between German, English, Spanish, French, Italian and Japanese in Language box and modify Default backup path to decide which path will play as the new default destination for following backups. For the other 2 check boxes, there will be no new version report any more if you uncheck the option Automatically check for updates. Join the Customer Experience Improvement Program can help us improve our product better with the info of your daily operation on our product. Besides the option Settings, Check for Update in the menu can help you manually check if there is any new version available. An error report which contains necessary info for analyzing a terrible product issue can be built with Generate Report. If you need a guide, Online Help will bring you to a detailed help file on Internet which includes description for every options in our product. The latest option About presents you a panel with some basic product info, your activation code and machine code. How to send an error report?